Commercial Plumbing, FishHawk, FL | A Step Above Plumbing Inc. Commercial Plumbing, FishHawk, FL | A Step Above Plumbing Inc.
We’re always ready and waiting to meet your commercial plumbing needs in FishHawk, FL. Every day, you work hard to keep your operations up and running smoothly. If something ever goes wrong with your location’s plumbing and you’re worried about how it will impact your operations as well as what you need to get done for the day, don’t worry. At A Step Above Plumbing Inc., we’re always ready and waiting to meet your commercial plumbing needs. We’ve been working with commercial plumbing systems in the FishHawk, Florida area since 2003, so we have seen it all. Thanks to this experience, we’re able to tackle plumbing jobs of all sizes, and we guarantee that if something goes wrong with your system, we can get things back up and running in no time. We realize that since your plumbing system needs to be functioning correctly for you to do business, commercial plumbing problems are extremely time-sensitive. After you reach out to us for help, we won’t take our time getting over to your location. Instead, we’ll treat the situation with urgency and get there as soon as we can.Once we arrive, we’ll take the time to assess what’s going on and come up with an effective plan of action. After we’re done working, you can rest easy knowing that your plumbing system will work like it should and that we did all of the repair work right the first time. 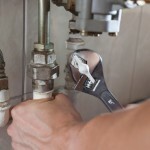 For all of your commercial plumbing needs, choose us at A Step Above Plumbing Inc. Contact us today to find out more about our services and how we can help your business!